Nicky Hodge works small. 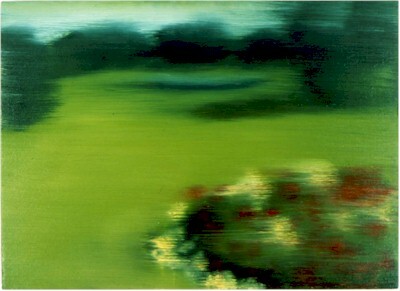 Paintings in series. Time spent in parks in a Polaroid blur. Sudden birds and incongruous flower beds whistle past. A sense of transience and lost detail. Familiar views often overlooked. Similar to certain other contemporary artists, Nicky Hodge presents landscapes that do not buy into faithful representations of the real world. Instead they rely on metaphor, glimpses stolen, partial views grasped in passing. In a separate series of drawings, objects are remembered from childhood. Small memories, little rites tells tales of pet hospitals, dentures by the bed and Japanese dolls wigs. Nicky Hodge studied at Central St Martins College of Art and lives and works in south London. She has had solo exhibitions in London and Birmingham. A selection of her Polaroids was published this year in the Women Artists Diary 2001.